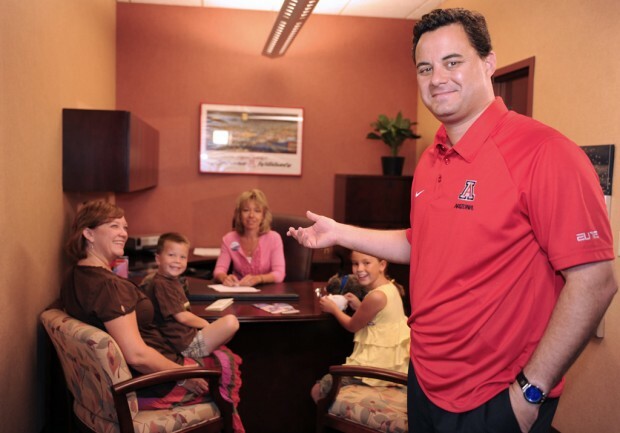 Sean Miller, UA men's basketball coach, has appeared in ads for Hughes since 2011. A local credit union that features University of Arizona basketball coach Sean Miller in its advertising won’t be doing so in the wake of criminal charges against assistant coach Book Richardson. Hughes Federal Credit Union, which has used Miller in its promotions since 2011, has scrubbed the coach’s photos from its website and is not airing its popular television ads, even though Miller has not been implicated in wrongdoing. “We’ve paused our promotions featuring Arizona basketball on our website during the investigation,” credit union spokeswoman Kellie Terhune Neely said Friday. Miller has not commented since the FBI implicated Richardson in the bribery scheme. The head coach has canceled an event planned for Wednesday at a local rotary club. The UA announced this week that it will launch an independent investigation into Richardson's actions, and is preparing to fire him. Book Richardson isn't the only Arizona Wildcats coach, player to face pressure in wake of FBI probe. The Wildcast Episode 19: Will Sean Miller be coaching Arizona this season? Watch: Greg Hansen on the state of Arizona Wildcats basketball during "our Watergate"